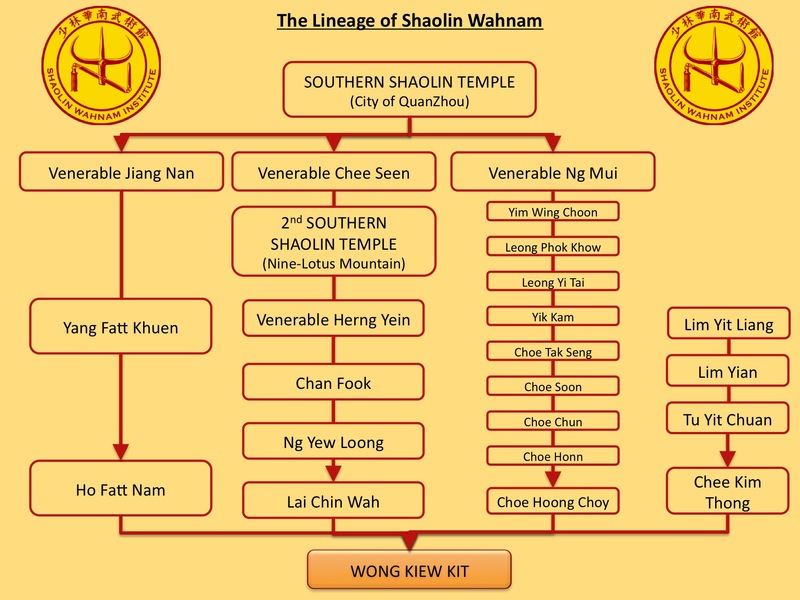 We in Shaolin Wahnam are very proud of our lineage which can be traced back directly to the two southern Shaolin Temples, as illustrated in the chart above. Not many people realize that there were two southern Shaolin Temples, one in the City of Quanzhou, and the other on the Nine-Lotus Mountain, both located in Fujian Province of South China. During the Ming Dynasty (14th to 17th century) a Ming emperor built a southern Shaolin Temple in the City of Quanzhou in Fujian Province as an imperial temple to replace the northern Shaolin Temple in Henan Province. This temple was burnt by the Qing Army around 1850s led by the crown prince Yong Cheng with the help of Lama kungfu experts from Tibet. Our Grandmaster, Sifu Wong Kiew Kit, learned from four sifus, or teachers. Grandmaster Wong's first sifu was Sifu Lai Chin Wah, more widely known by his honorable nick-name as Uncle Righteousness. His second sifu was Sifu Chee Kim Thong, regarded as the living treasure of the People's Republic of China during his time. Grandmaster Wong's third sifu was Sifu Ho Fatt Nam, the third generation successor from the southern Shaolin Temple at Quanzhou. His fourth sifu was Sifu Choe Hoong Choy, the patriarch of Choe Family Wing Choon. It was no co-incidence that all Grandmaster Wong's sifus were patriarchs of their respective styles because Grrandmaster Wong sought for the best available teachers. Our school, Wahnam, is named after Sifu Lai Chin Wah and Sifu Ho Fatt Nam as much of our instructional material came from them.